Hey all. This is gonna be a bit of a long post but I feel like I have enough here to keep your interest for a bit. I bought this car in 2012 with 320,000kms on the clock. 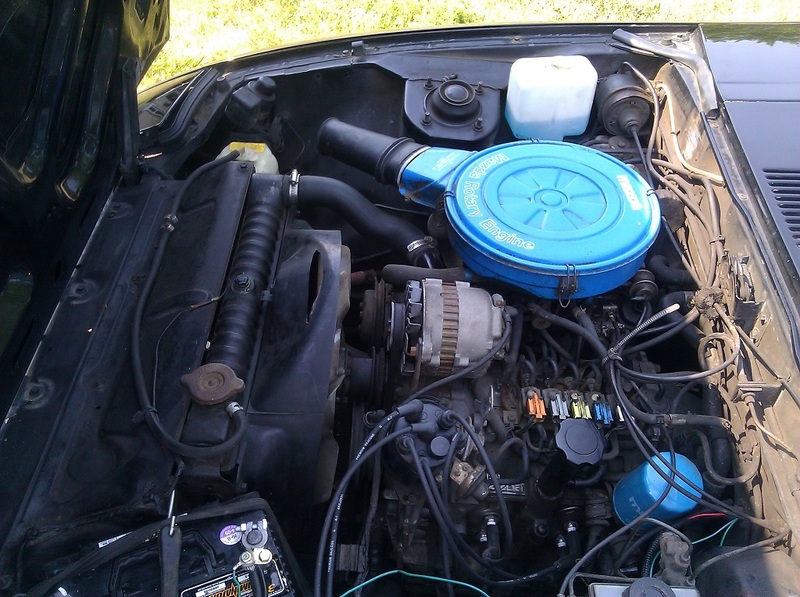 Came with a bunch of paper work, was on its second engine at least but it runs great and has no real faults other than a trashed interior, which I never even took photos of. 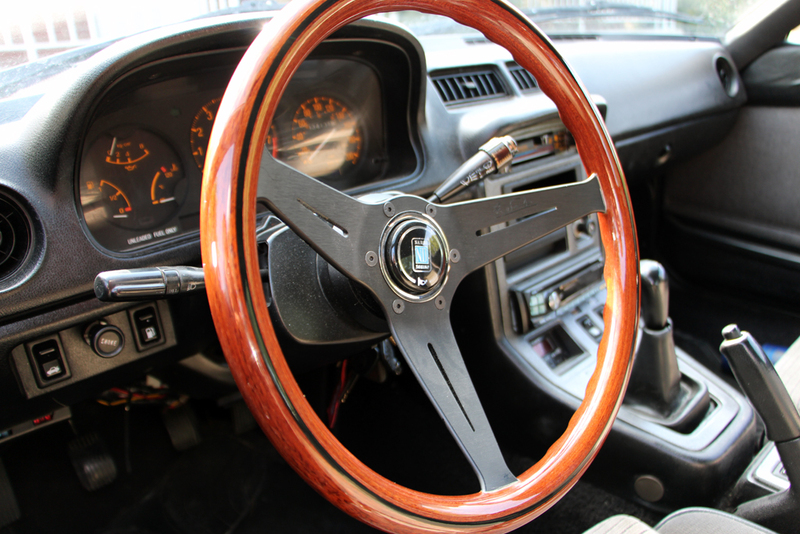 The car is a GSL with power windows, mirrors and 4 wheel disc. 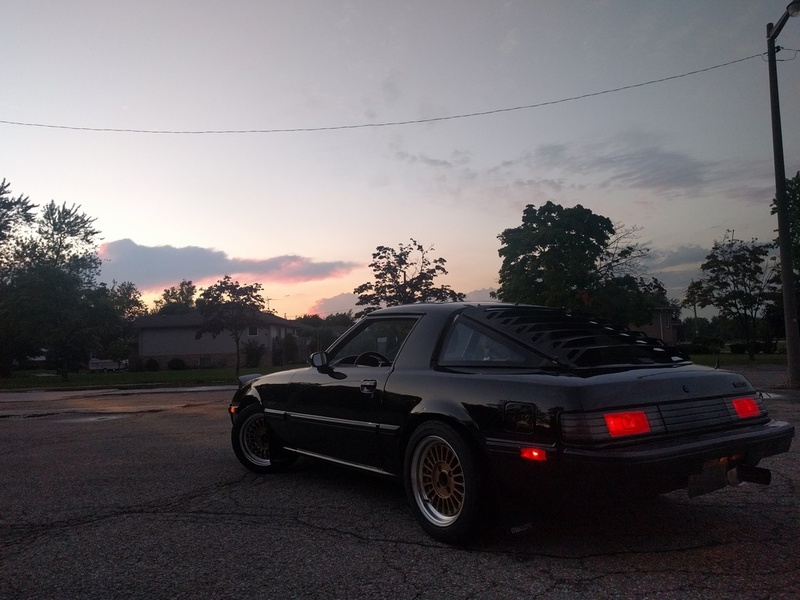 I did a bunch of modification to the car that I considered tasteful and never really stopped me from driving it for very long. Emissions delete, rebuilt the carb, Racingbeat Frisbee and other racing beat engine bay stuff like oil lines and rad hoses, T3 Coilovers on all 4 corners, a good set of brake pads, wheels, tires, energy suspension bushing kit, rear louvres, Mazdatrix driveshaft, S3 door panels and seats, Nardi Classic steering wheel, Mazdatrix shifter and a full exhaust by Glease Manufacturing. 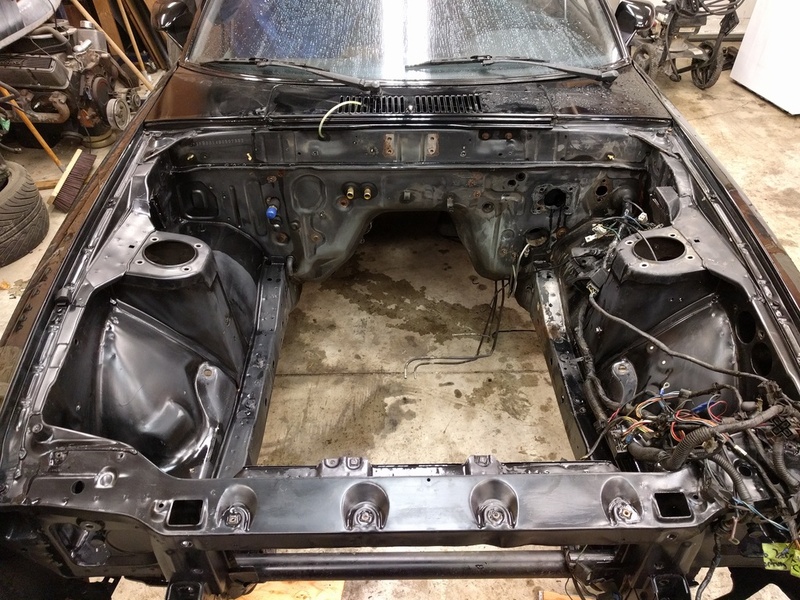 The car was always a blast and although it had its fair share of problems (failed rear end, failed transmission), I was always able to source parts and get it back on the road no problem. The wife and I took this car all over the place any chance we could get, even though its loud and old and stuff. 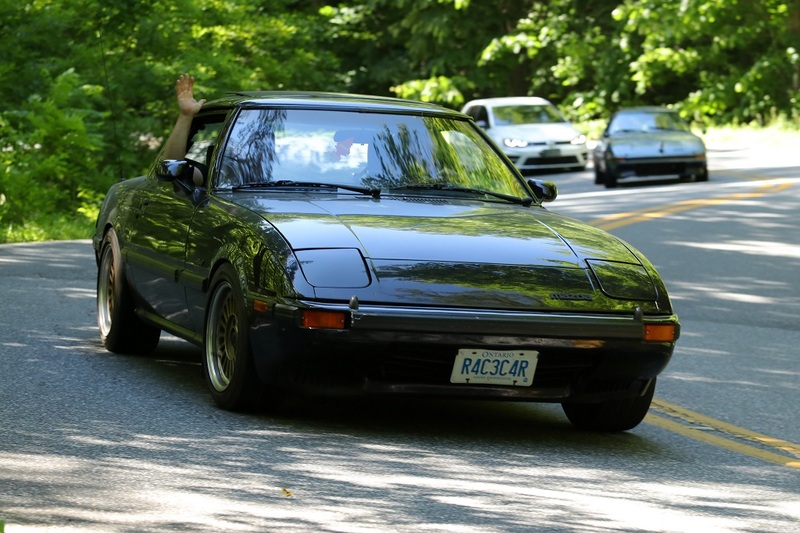 Last year in June for my bachelor party myself and all of my best car friends took our crap down to Deal's Gap. 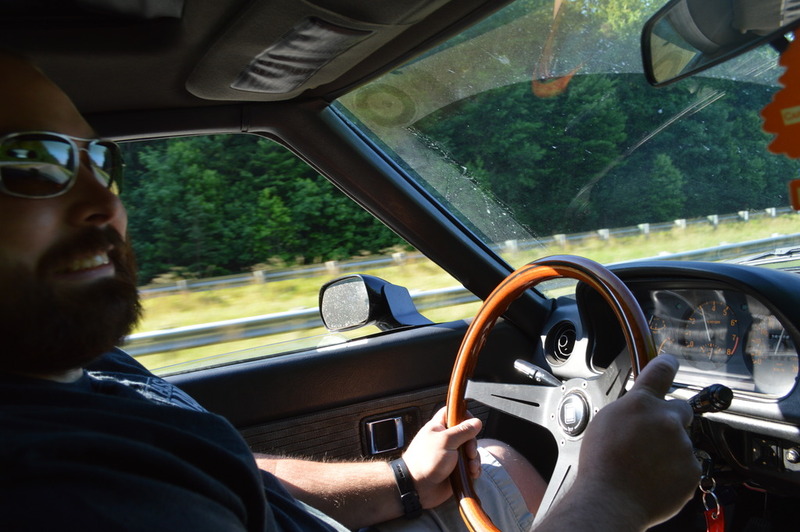 Here's a picture of the car on the gap with myself driving, and an interior shot of John Gleason (Glease Manufacturing) moments before running a squirrel over. Ill post that video sometime. After that 2500km trip in some super hot weather with no A/C, I was driving my other vehicles for a bit without thinking too much of the Mazda. But in my head I knew I hated the steering, wasn't quite happy with the way it sounded, hated the front suspension with the shocks basically 95% compressed while sitting still, tiny front brakes and it needing a ton of money in just maintenance (ball joint boots all torn, ancient brake caliper dust boots and slider boots disintegrating, front and rear rotors warped from the gap trip) I was starting to think of something else. 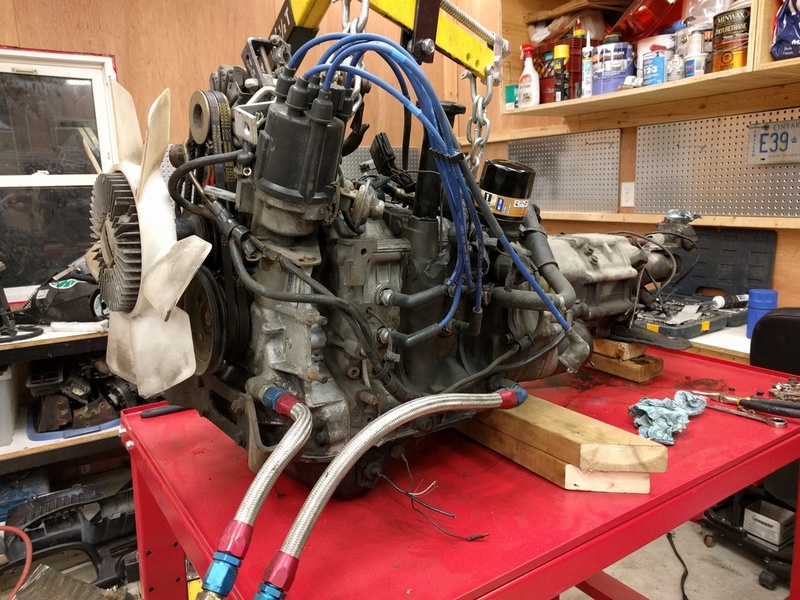 For years I had talked about dropping an aluminum piston engine in with no real thoughts of actually doing so. 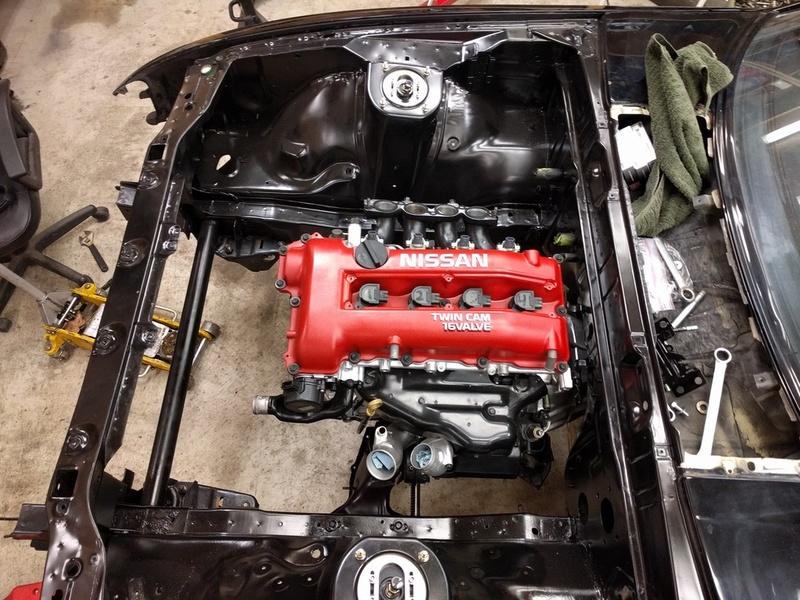 This past October I got a call from a buddy, who was working on a VW golf with his buddy that needed a bolt drilled out of the turbo so he could put his downpipe back on. I grabbed my 90 degree drill and my extraction tools and took it out for him. 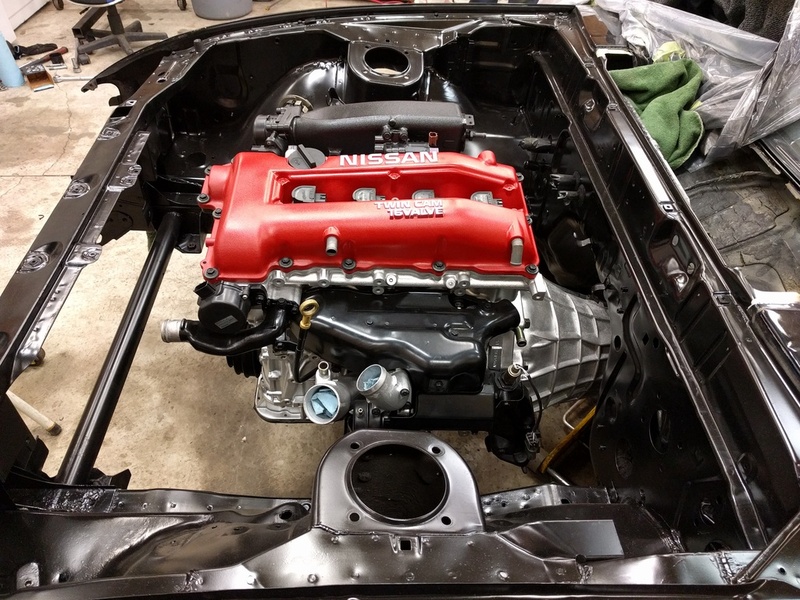 While doing that I realized he had the worlds most disassembled 240SX in his garage with an SR20DET on the floor, and he mentioned he had a spare block, head and oil pan when he bought the car. 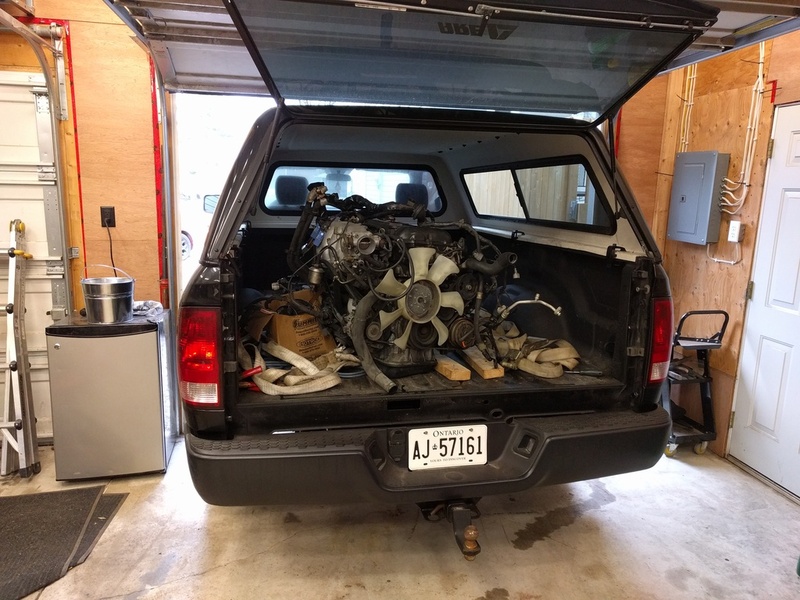 I told him I would take the engine stuff he was letting rot as payment. So I carted that junk home and started googling. 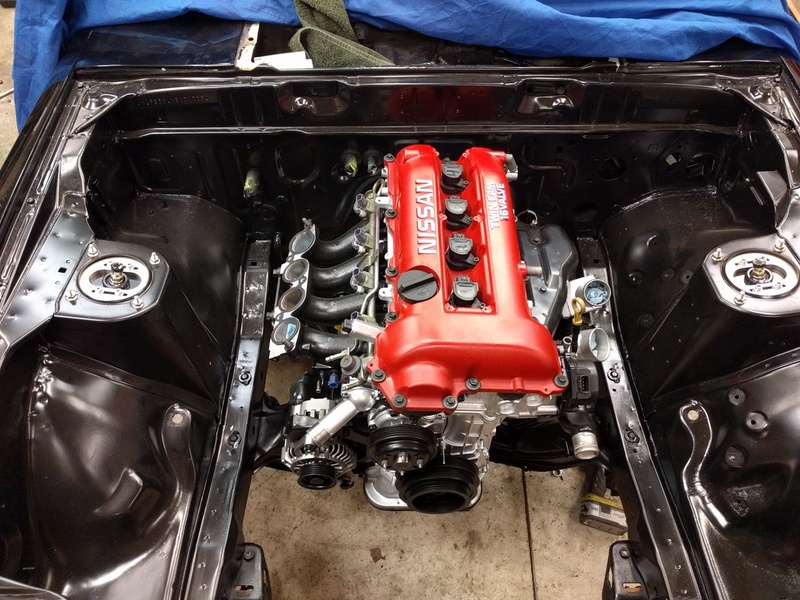 Came across an old build thread in this forum about a guy who did a lot of work with an FB and an SR20 swap but the thread kind of fell off. But it was enough for me. 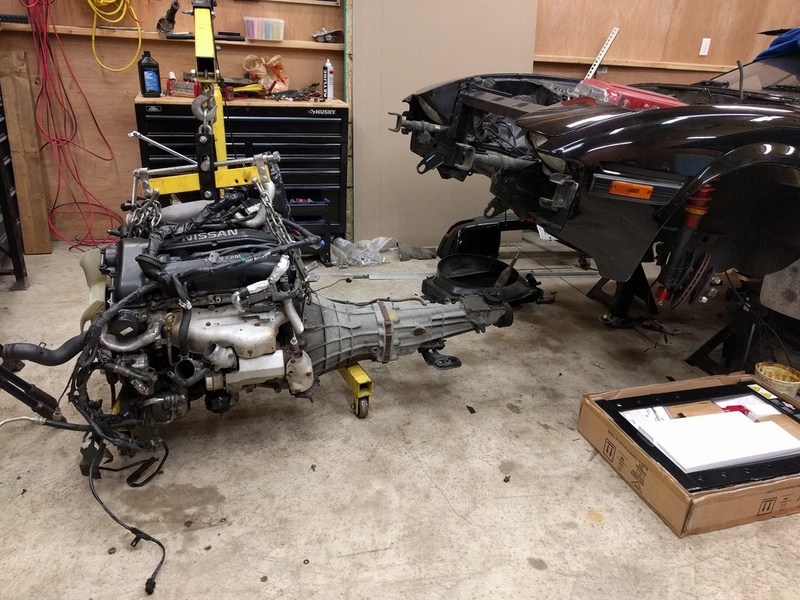 It had been a long time since I had done anything crazy with a build, and I ordered up an S14 subframe and rack/pinion, then proceeded to pull my engine out. 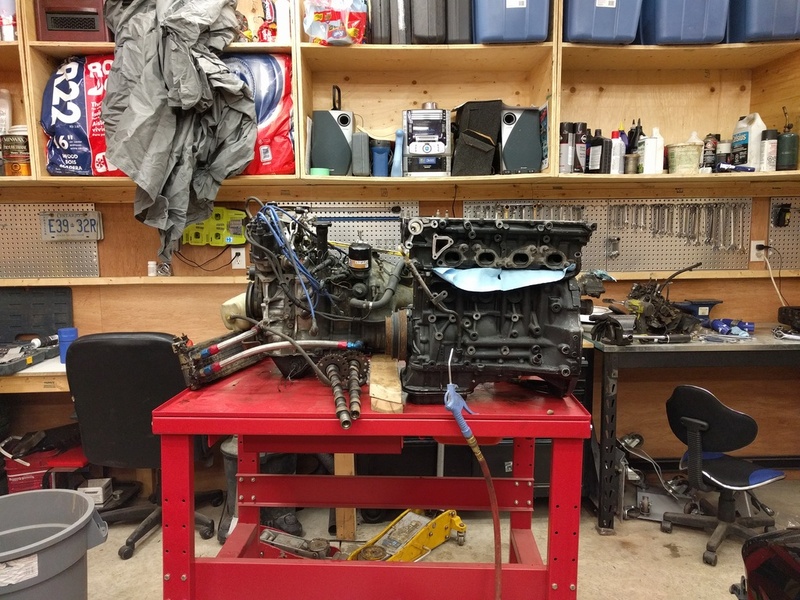 Here is the SR20 Block, head and oil pan compared to the 12a in height. Just might work. Last edited by sommmatt; 02-12-17 at 11:02 PM. 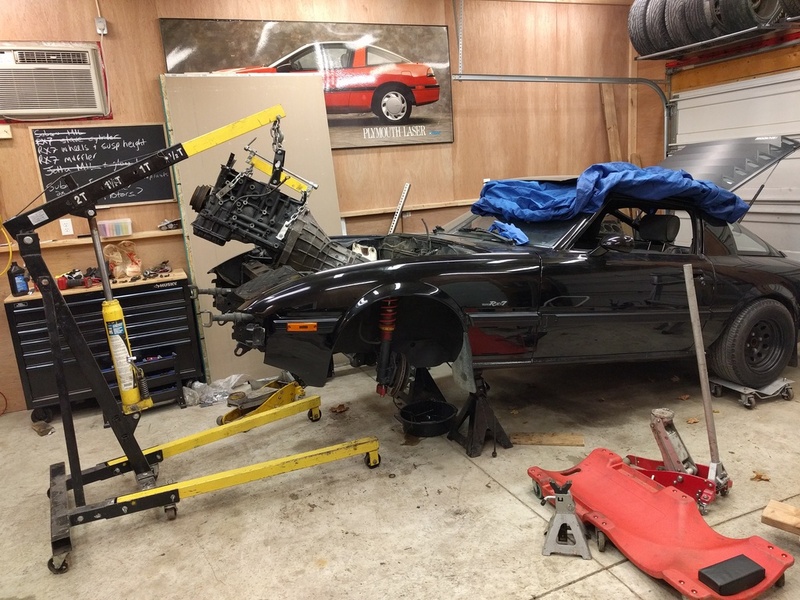 Then I bolted in my 240SX Steering rack and subframe, which were found on ebay for about 150 bucks from a wrecker in California. 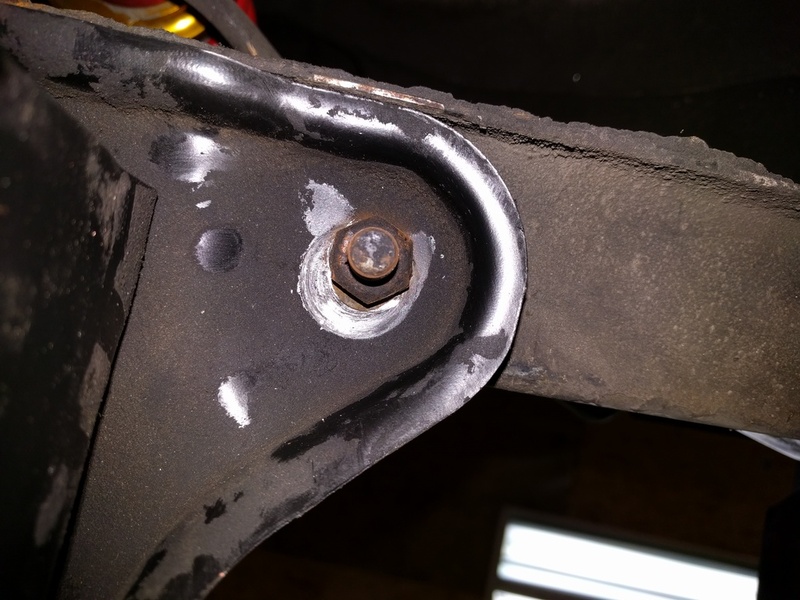 Had to widen the bolt holes just a little bit and it bolted right up. 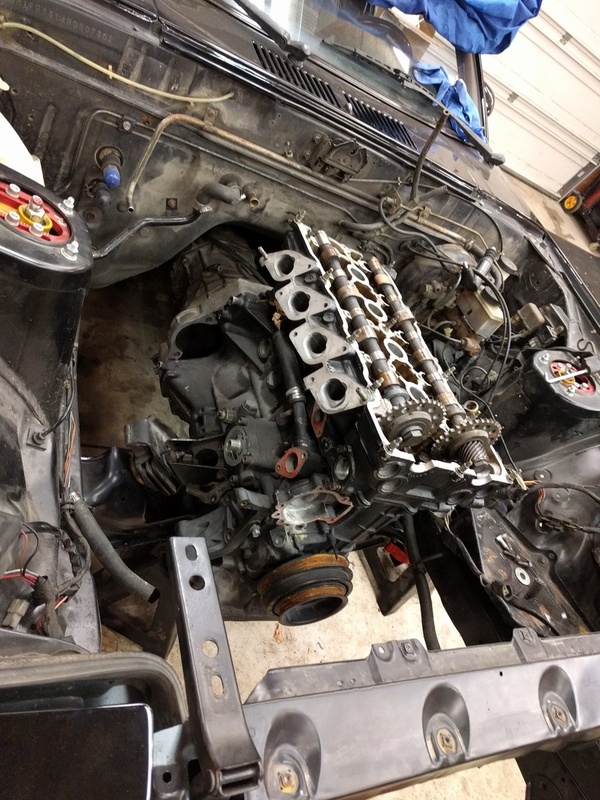 I then borrowed an SR20DET transmission from the same kid with his car in a billion pieces and dropped it in. 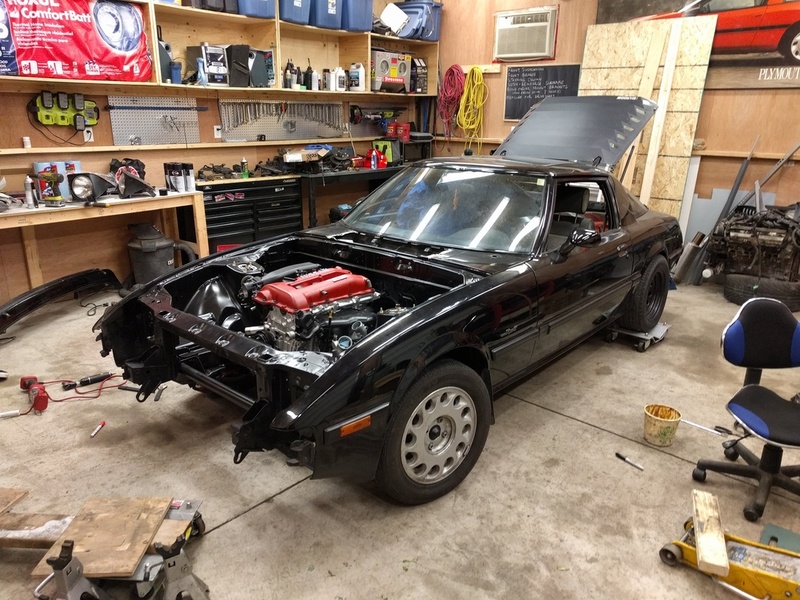 The engine sits a bit forward from the firewall, the transmission a little bit forward from the shifter hole, but good enough for me. Lets spend some real money. 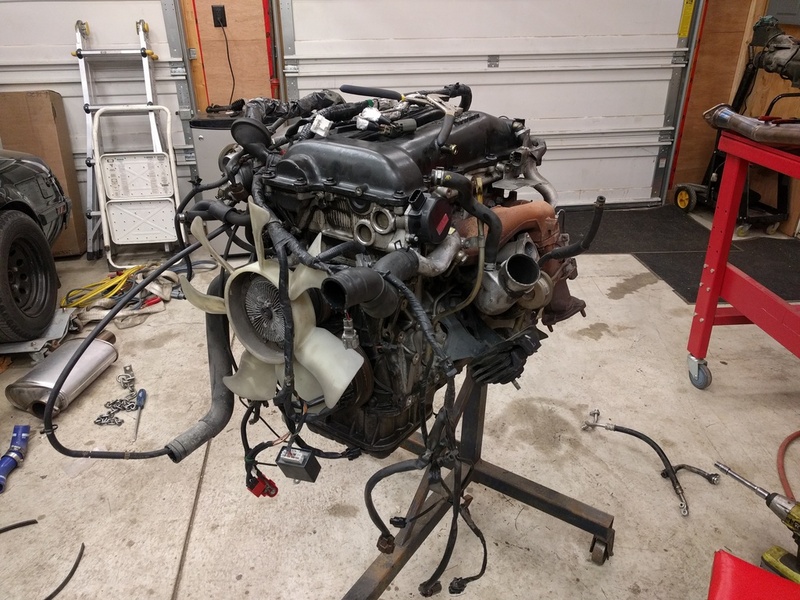 I picked up this "60000km" 1998 S14 SR20DET from an importer in Toronto, compete with wiring, ECU, transmission, etc. Looks ok. Started to clean it up. 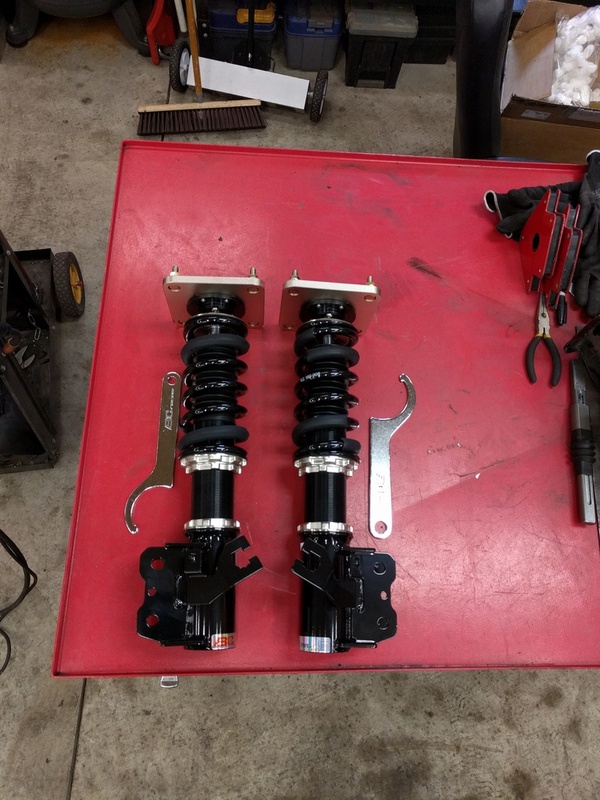 I spent about a million dollars at summit on steering shaft and column fabrication components. Here's all my stuff uncut. So I haven't talked about the suspension yet. 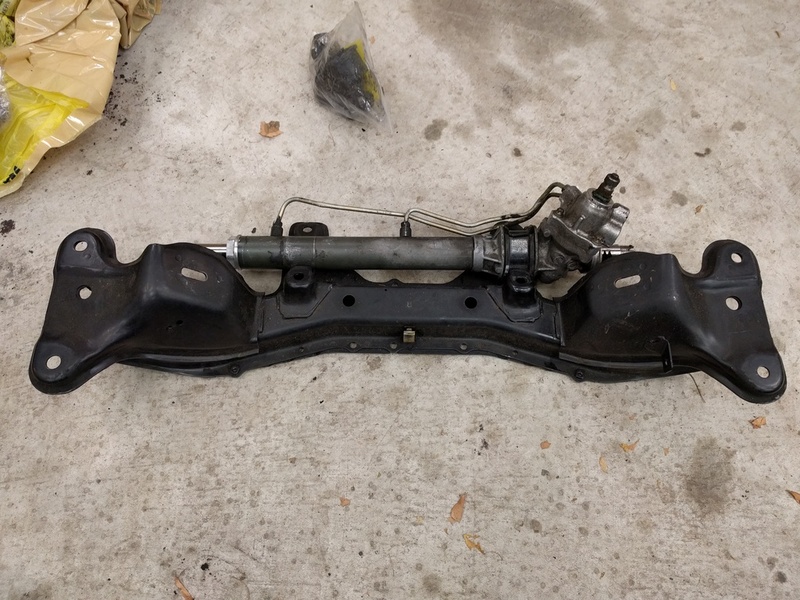 For about zero dollars you can order super chinese 240SX lower control arms and inner/outer tie rods, which will of course bolt into my rack and subframe. I ordered those. Also ordered a set of used steering knuckles and hubs from another wrecker on ebay. 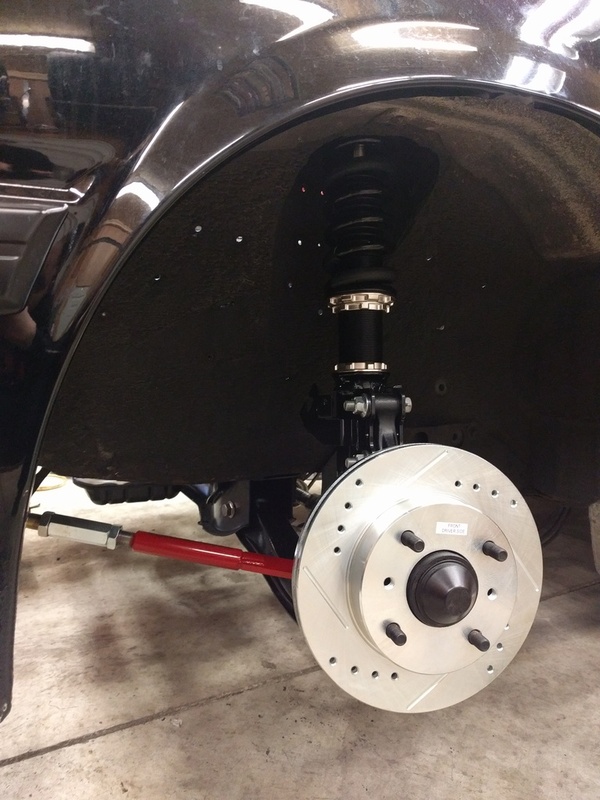 All of that stuff should bolt up no problem, so what about the coilover? Well I had TechnoToyTuning Caster/Camber plates before and they came with a bunch of different adapters to work with different shocks. So I borrowed a set of Stance coilovers for an S13, bolted my top hats to them, and installed them into the car like they should bolt there. Awesome. 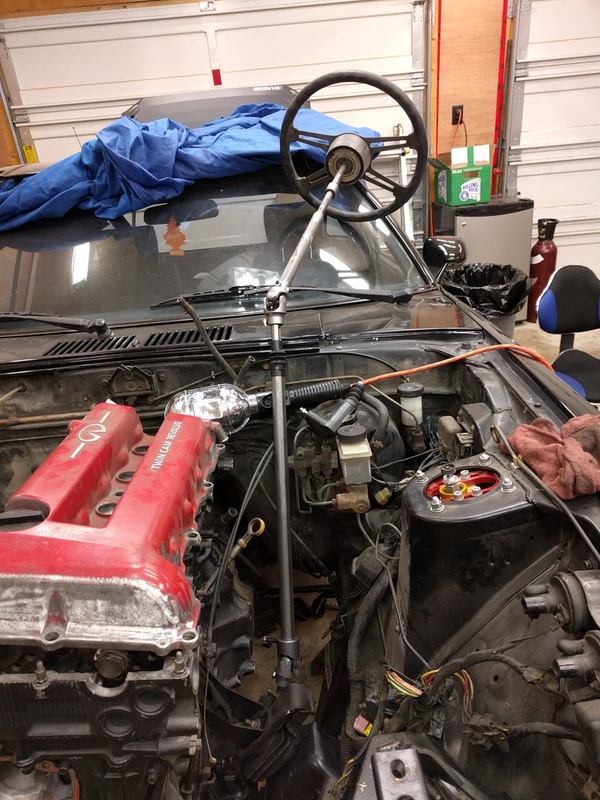 Flipped over the stock tension rods, extended them a bit and drilled one hole, and they bolt directly to the S13 lower control arms. 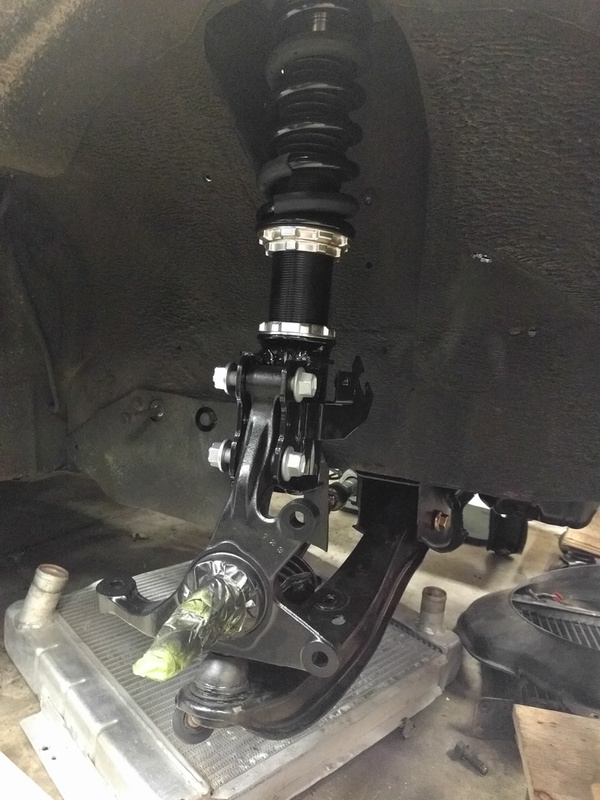 The sway bar kind of works, but it will interfere with the shock and I wont use it. Either way, good enough. 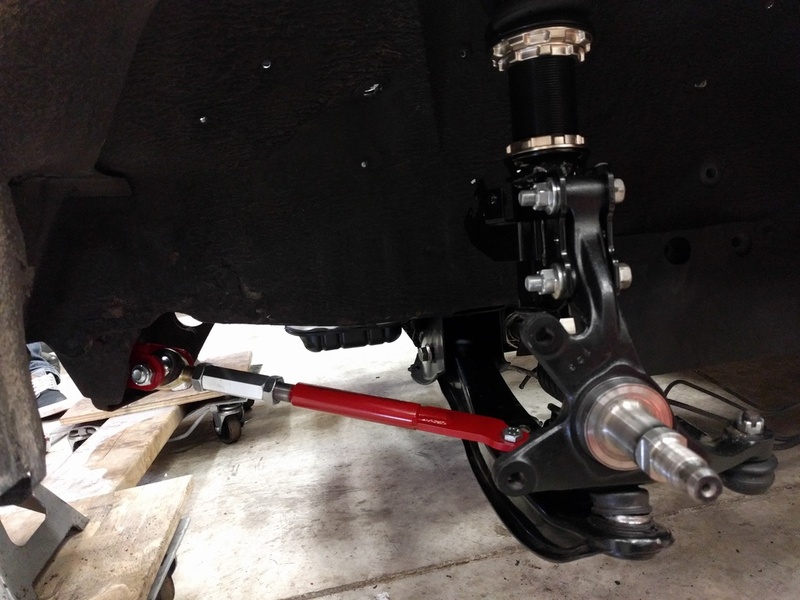 Here's a pic of the suspension mockup. Which also means with a full S13 suspension on the front of the car, I can use the larger and (better?) 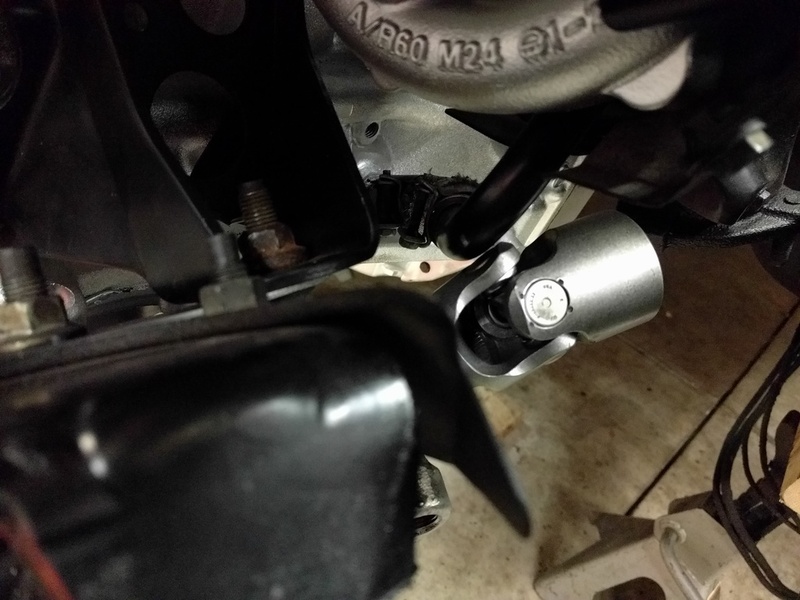 stock S13 front brake setup, or quite easily upgrade to a bolt on Z32 front brake conversion, which I used to have on my 240SX. But a good set of pads and rotors should do just fine on this. 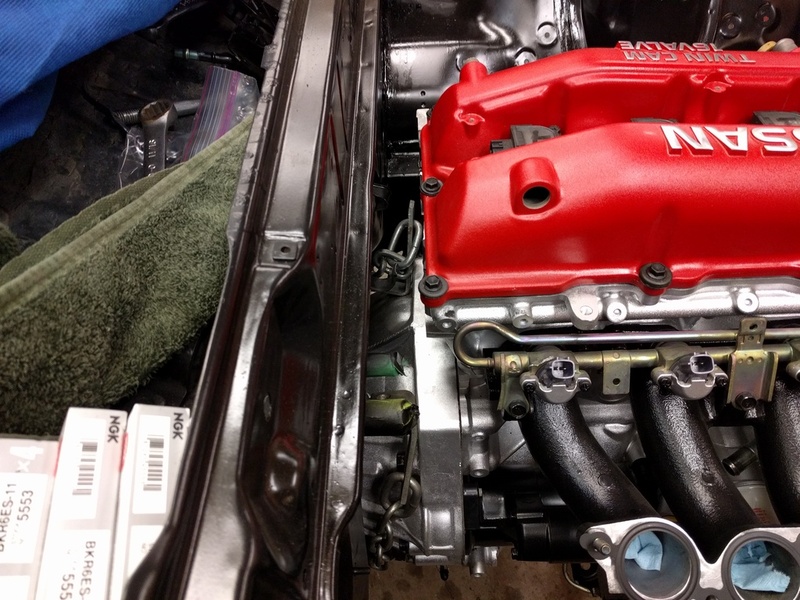 In the meantime, I finished detailing the engine and had the valve cover powder coated. 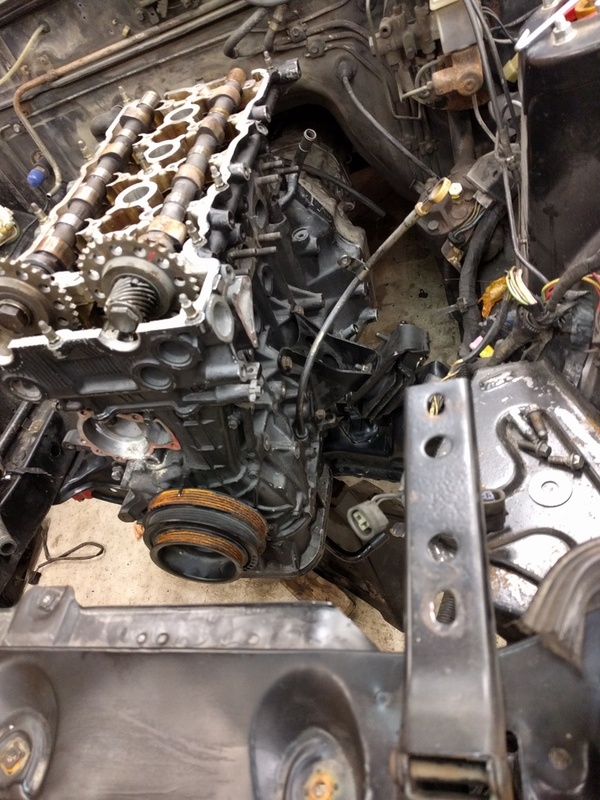 It was necessary to remove the internal baffles from the valve cover for the sandblasting, otherwise it ends bad later on when trapped sand finds its way in your bearings clearances. 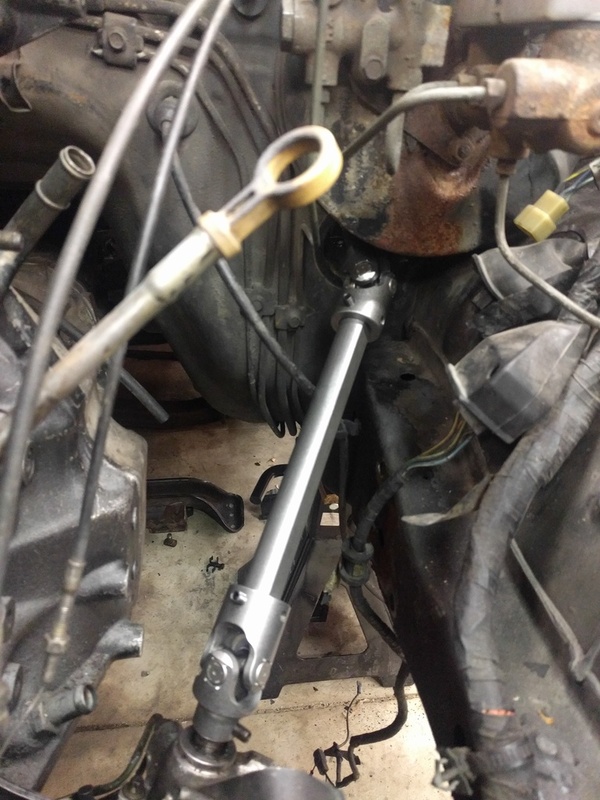 Here is the cut down steering shaft, the column stuff isn't pictured yet as I haven't finished it. 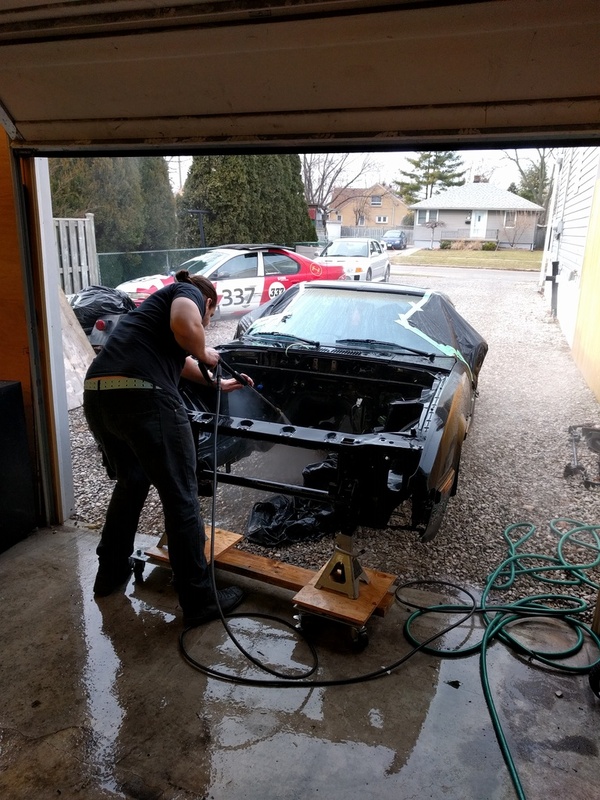 Anyway, pulled all that junk mockup stuff out, and rolled the car outside as far as I could to power wash it. 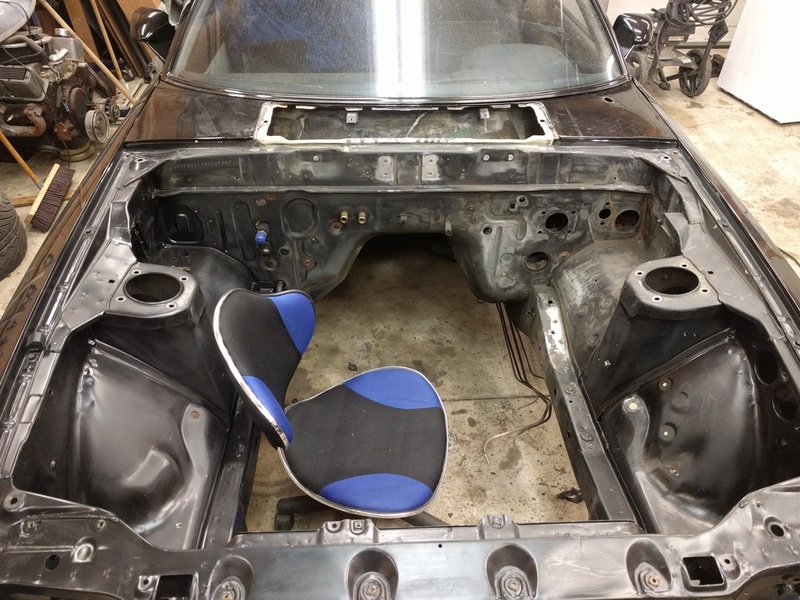 That's Chris, roarinrotaryrx7 doing the hardwork. He's been around for a lot of the stuff on this build, always offering an extra hand. 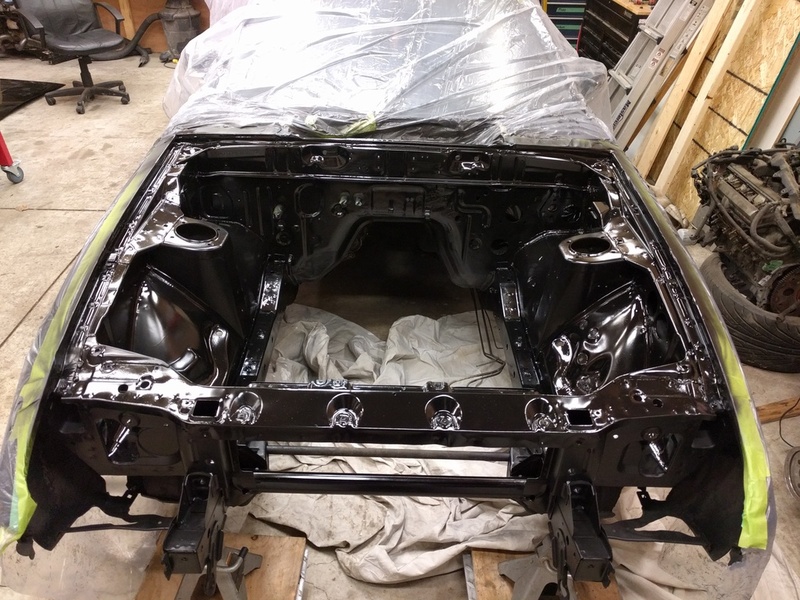 Then we cleaned it up and gave it a few coats of paint. This was a dirty *** engine bay, even after the power washing we used up an entire bottle of sunlight dish soap and simple green degreaser, along with 4 or 5 scotchbrite pads just to get the ground in dirt out. 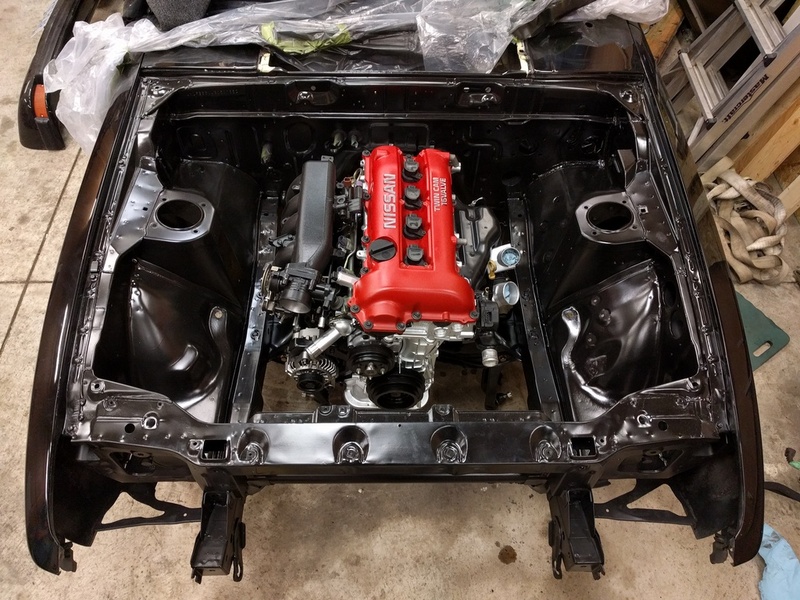 I had done a half job of painting the engine bay a couple of years earlier, it used to be a lot worse. 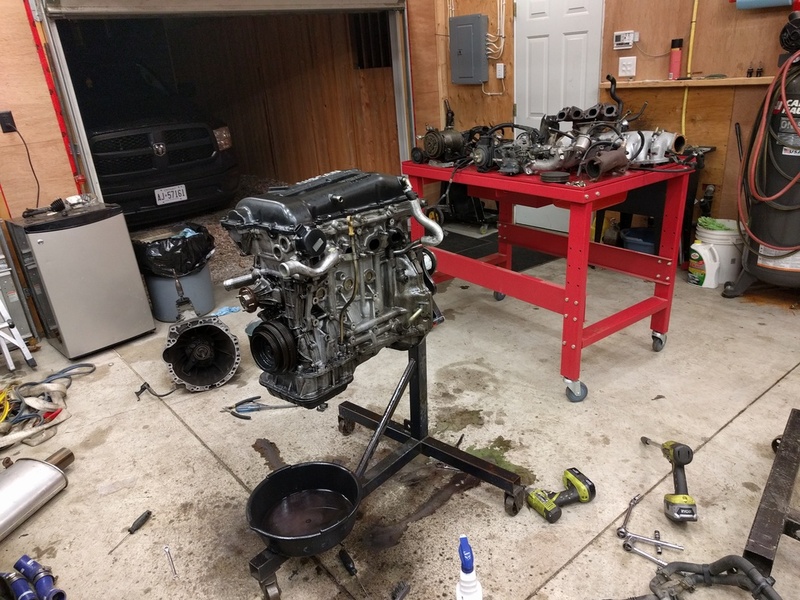 And then it was finally time to drop the new engine and transmission into place, because they were taking up room more than anything. Looks amazing if you ask me! 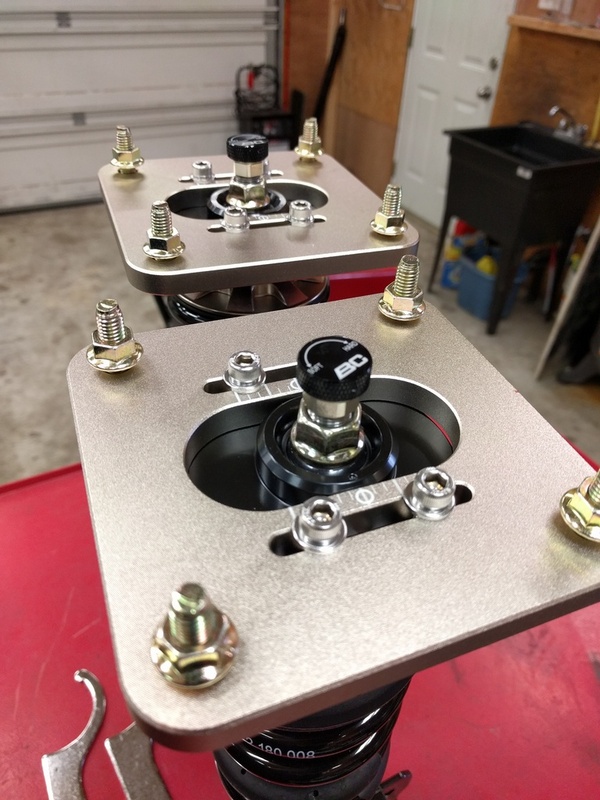 Moving on, some of my fancy suspension bits came in the mail. 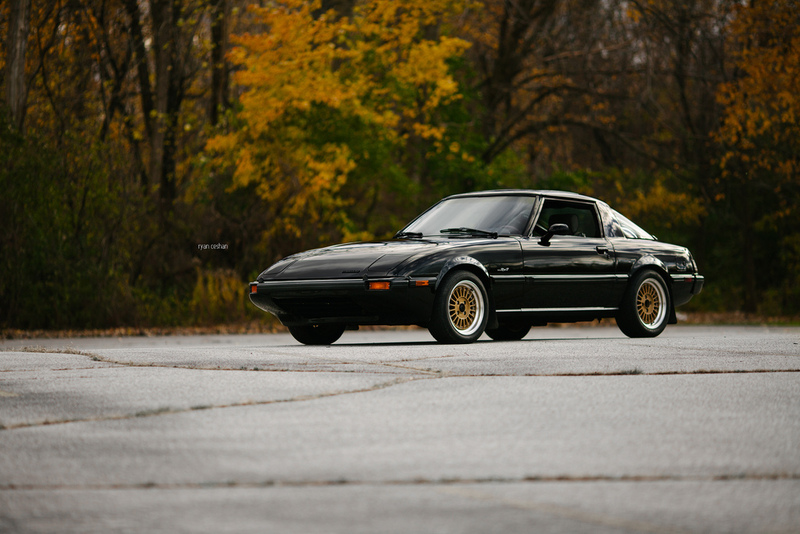 I messaged BC Racing if they would build me a coilover that bolts to an S13 knuckle with an FC RX7 tophat. They said no problem, and built it up. Further I ordered a set of adjustable tension rods from Techno Toy Tuning. 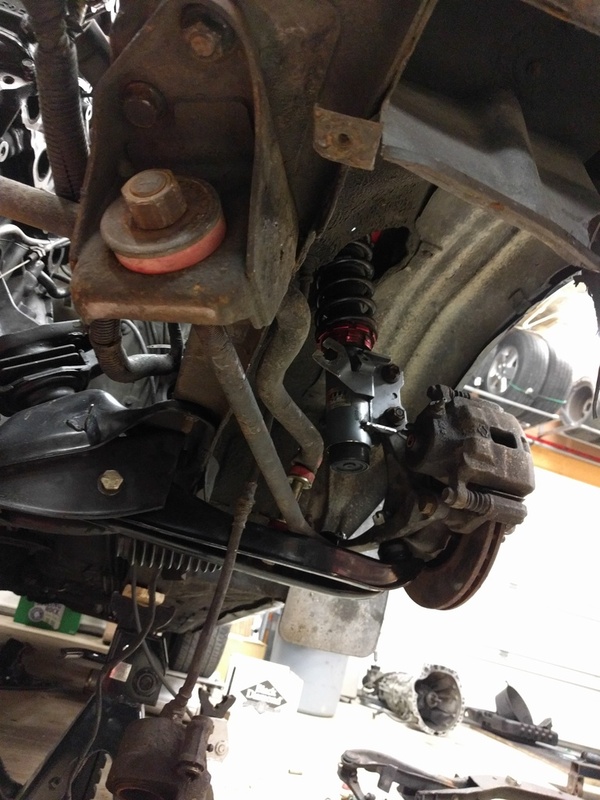 With just a bit of ovalling on the upper strut mount holes, I bolted my entire front suspension together. Here it is with the 240SX brake rotor. 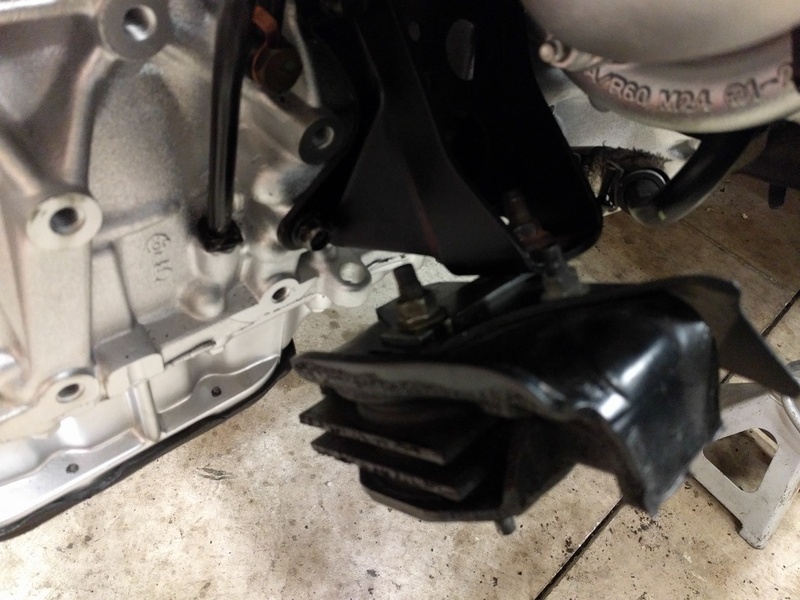 I've also got new Power stop pads and OEM calipers and flex hoses, but those aren't pictured. Then I dropped it down on my old 240SX wheel just to see and make sure the suspension actually holds the car up. Those 205/60/15s are hilariously tall on this car. 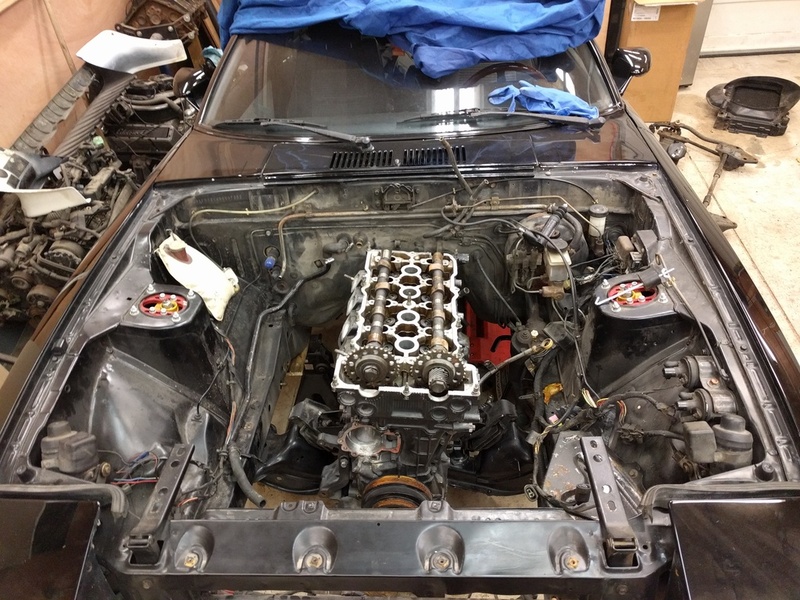 Remember when I mentioned before the engine sits forward on those 240SX mounts? You should be able to see how far forward it is in the pictures above. 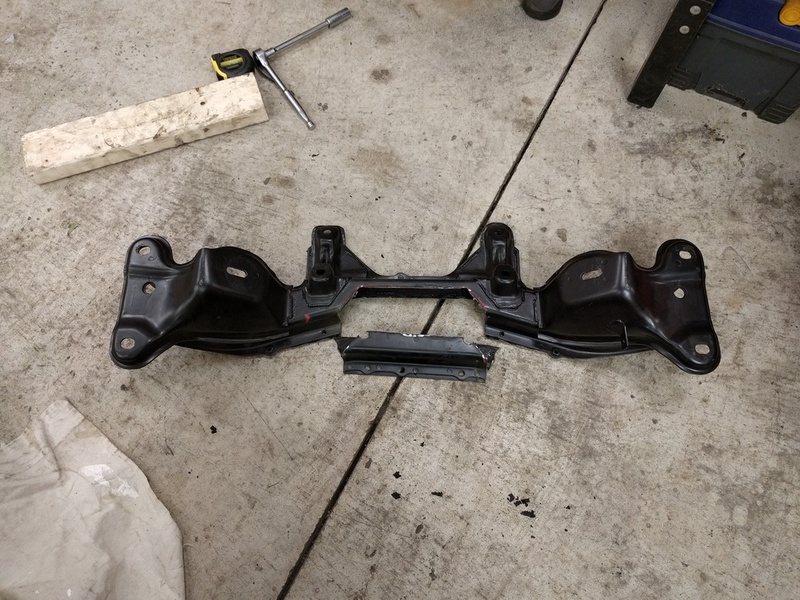 The car's stock transmission mount ALMOST lines up (the RX7 mount will bolt to the 240SX transmission, but the mount is about 1.5 inches away from the stock crossmember). 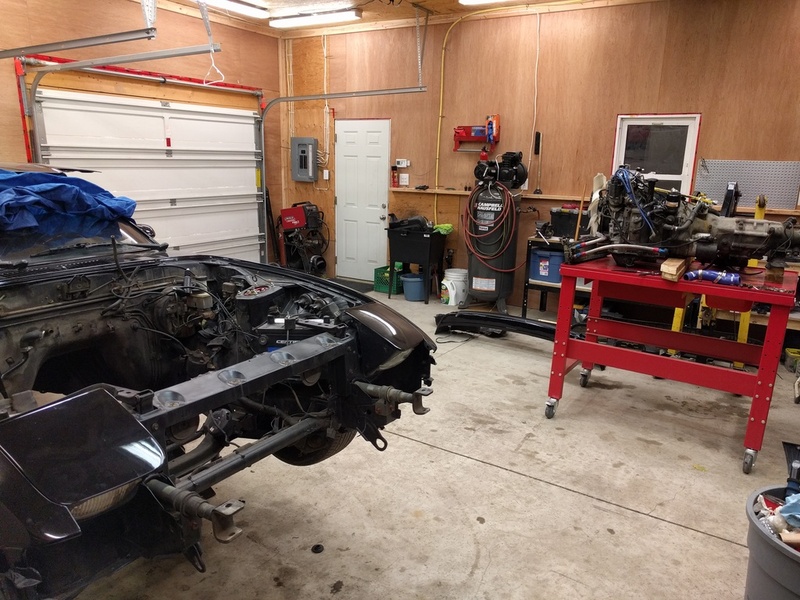 My original plan was to bolt the transmission to the crossmember and just move the engine back as far as that took it, but I decided I should go as far back as I can get, because fitting a radiator will NOT be easy where it is now. 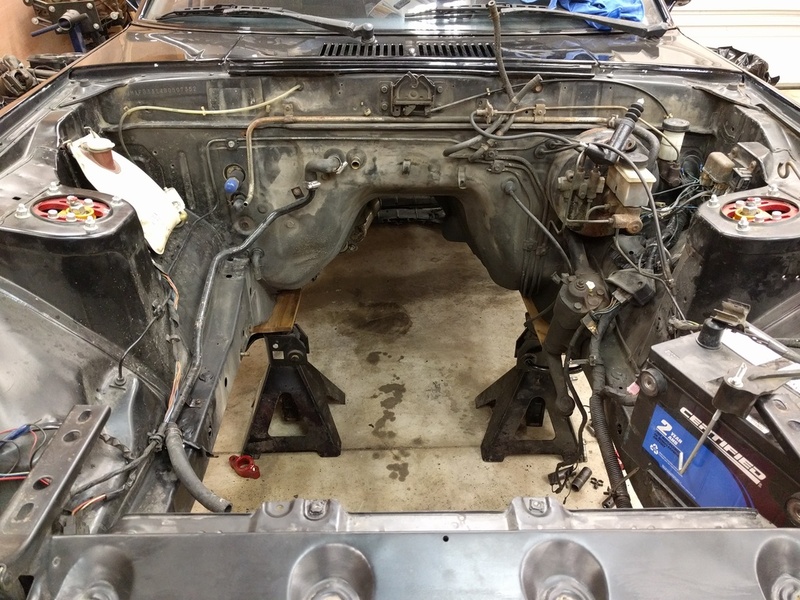 I decided I need to move the engine about 2.5 inches rearward, without moving the subframe, so that's a little tricky. 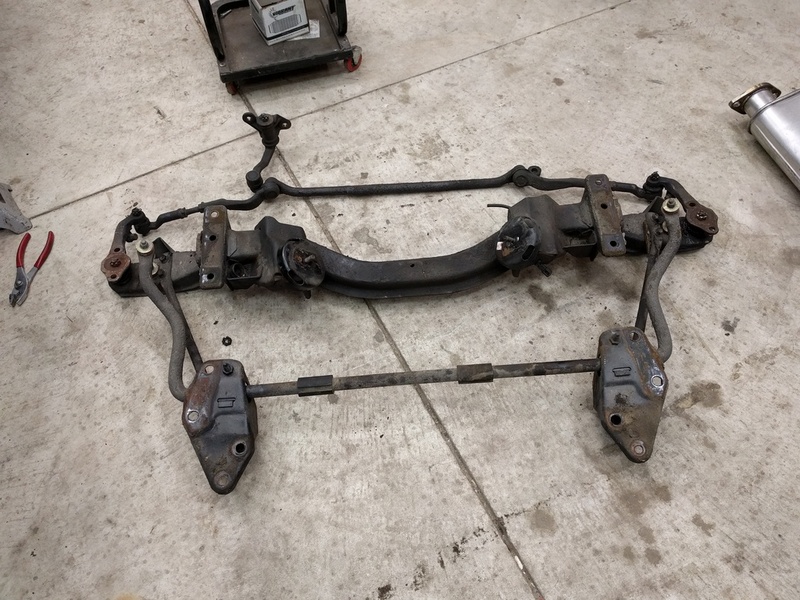 You have to cut a **** ton out of the subframe, which I'm not afraid of, I did it before when I did the LS swap on my old 240SX about 5 years ago. 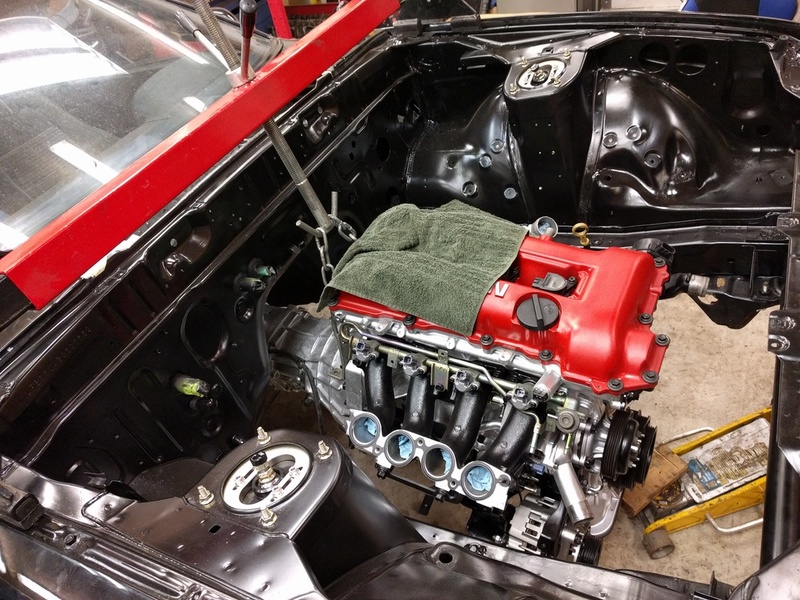 Also need to move the engine backwards on the mounts, but i don't know what this will interfere with. This also of course means making a custom transmission crossmember, but that's a problem for another day. So I dropped the subframe back out and cut the crap out of it. 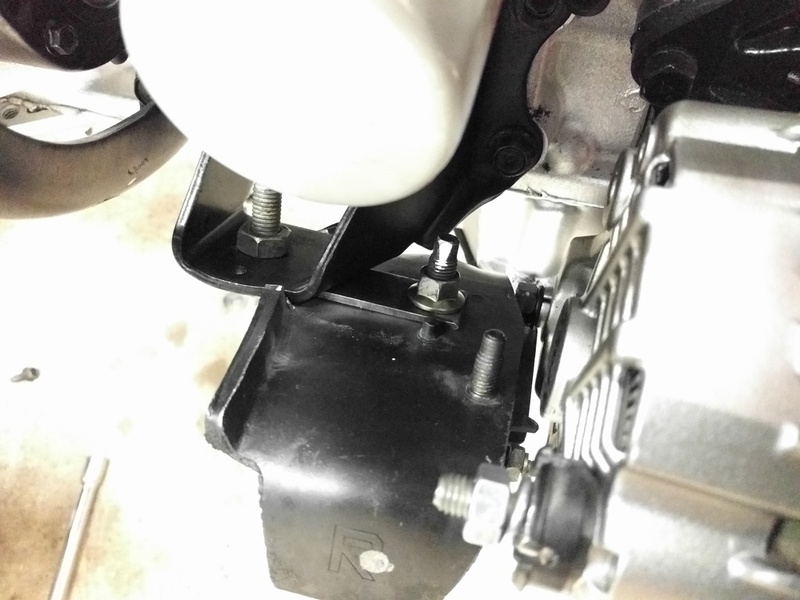 Then made spacers for the engine mounts to move them 2.5 inches backwards, and reassembled the whole thing. Very tight clearance on the alternator, but workable, especially with a smaller mount, like the ISIL mounts. 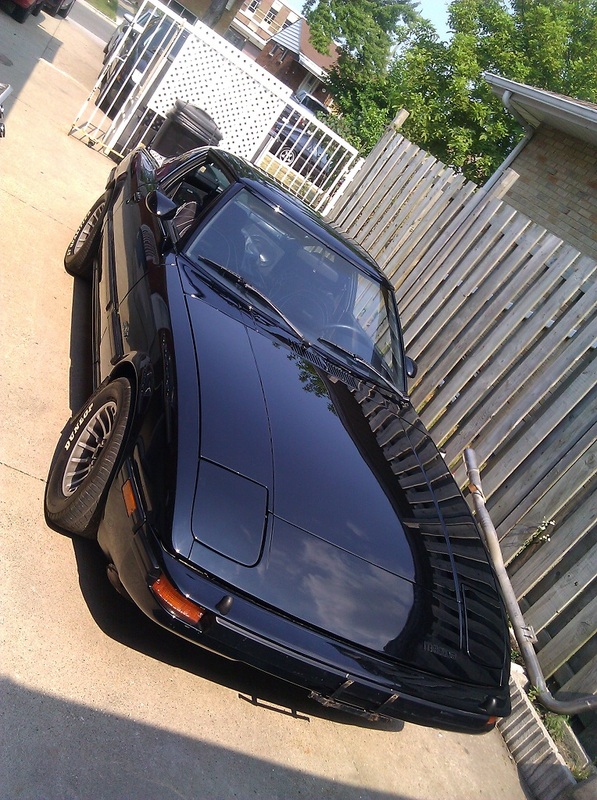 Not bad on the turbo side of things, but it may interfere with the A/C compressor down the road. Not today's problem. 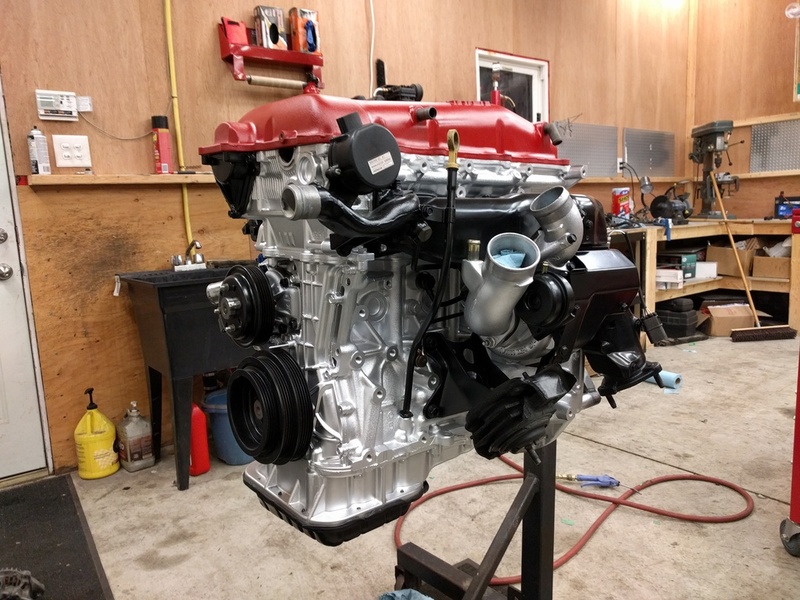 But now the engine sits right where it should! The shifter hole comes up perfect as well. With the shifter installed along with the console pieces, you can't even tell it's the wrong one for the car. 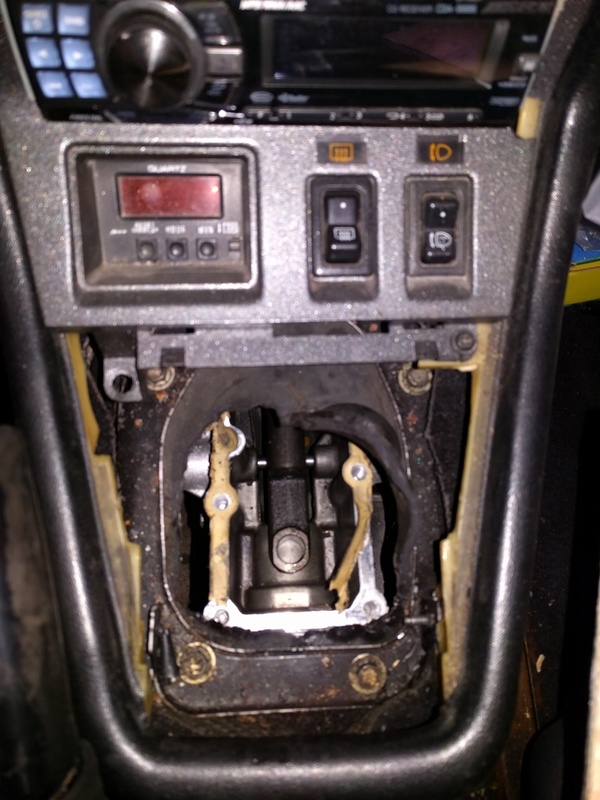 The steering column now makes contact with the oil drain tube. So now I have to figure out a new solution for that, but otherwise everything is coming up Milhouse. Next steps? 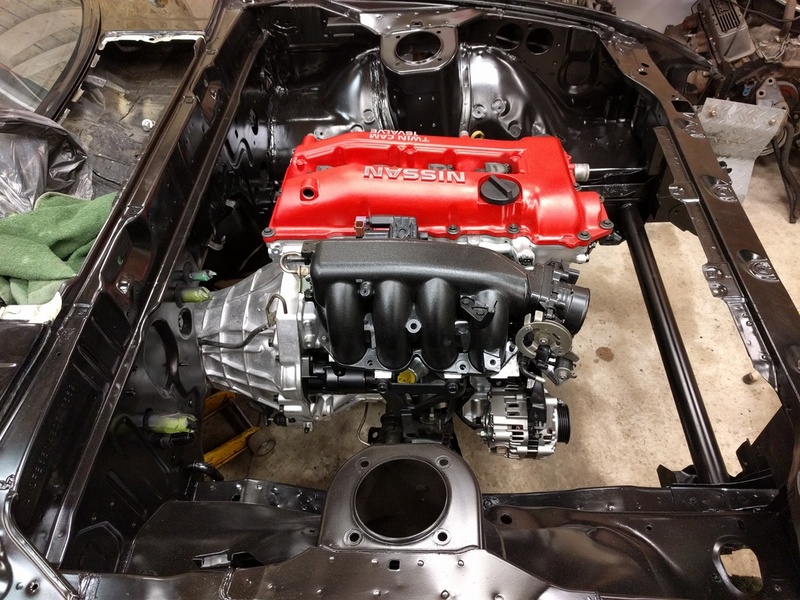 Build some permanent motor mounts rather than just the test piece of flat stock, then build the transmission mount. 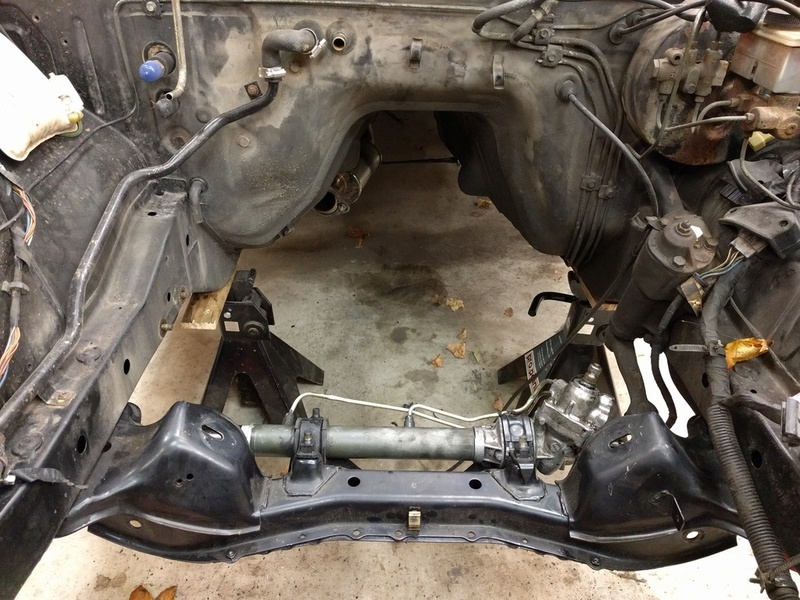 Remove the crossmember from the vehicle, and box it and weld it up solid. This is as far as I am at for now, but I think it is a pretty solid start. Once all of the hard parts are in I will start putting real thoughts towards the electronics side of things.